This is a step by step guide on how to train a model from the Marketplace with your own dataset. The first step is having Docker installed. To have an up-to-date installation please follow the official Docker installation guide. The first step is to choose a model from the DEEP Open Catalog marketplace. For educational purposes we are going to use a general model to identify images. This will allow us to see the general workflow. You can see this last step explained more in detail here. We are using the port 5000 to deploy the API and the port 6006 to monitor the training (for example using Tensorboard). 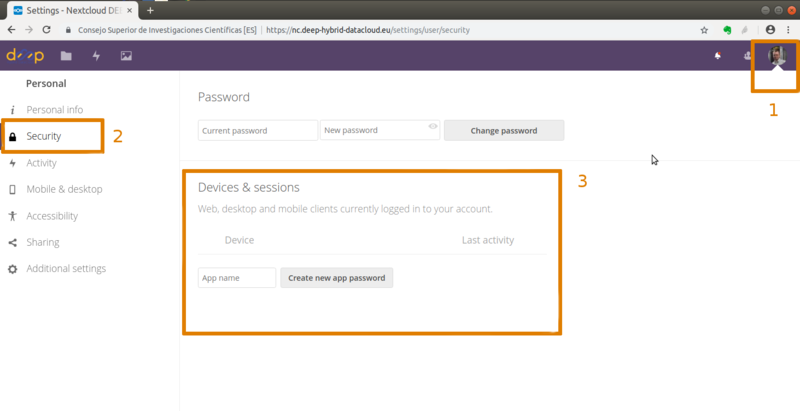 Set a name for your application (for this example it will be deepnc) and clik on Create new app password. This will generate <your_nextcloud_username> and <your_nextcloud_password> that you should to include in your rclone.conf file (see more details.). Now comes the fun! Go to http://0.0.0.0:5000 and look for the train method. Modify the training parameters you wish to change and execute. If some kind of monitorization tool is available for this model you will be able to follow the training progress from http://0.0.0.0:6006.